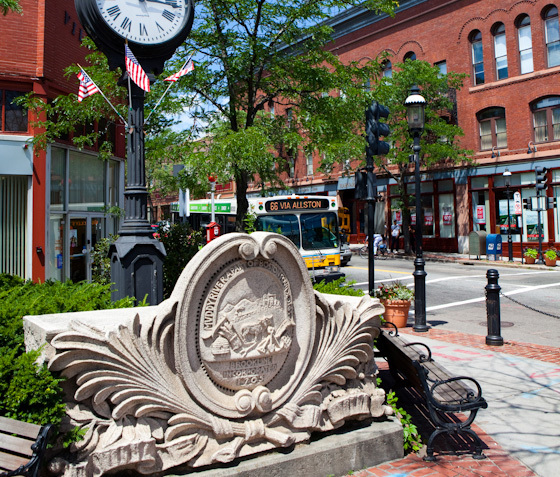 Brookline Village is an eclectic commercial and residential district near the Longwood Medical area. The Village itself has a wonderful mix of shops – ethnic restaurants, yoga studios, day spas, and all manner of boutiques from Serenade Chocolatier to Abeille’s bead workshop. The Brookline Village T stop is on the D line for a quick commute downtown (much quicker than taking the C or B line, we might add). Real estate in Brookline Village is a mix of smaller brick and frame condo buildings and single family homes. Unlike, say, in Coolidge Corner, condos in Brookline Village tend to be part of smaller 3-6 unit associations and are typically older construction from the late 1800’s to early 1900’s. If you want to live within easy commuting distance of the downtown Boston, the medical area but appreciate a more relaxed and offbeat atmosphere – you gotta check out Kookoo café before you hope on the D train downtown! – then Brookline Village might be the right spot for you.